With today’s issue of Doctor Aphra, we’ve reached the mid-way point in The Screaming Citadel, the crossover between Aphra’s solo series and the main Star Wars book. The crossover, co-written by Kieron Gillen and Jason Aaron, gives us a story inspired by gothic horror, yet it feels like it fits the Star Wars Universe perfectly. Doctor Aphra 7, written by Gillen, begins where the last issue left off. Luke and Aphra are running away from a bunch of mutant freaks under control of the Citadel Queen. The citadel itself continues to prove itself a great setting in its own right, as a very high tower that mixes creepy labs with dark corridors and a roof full of pretty looking plants. After Luke’s friends arrive to help, things get really intense. The conflict between Aphra and Luke’s friends is very intense, especially with Sana Solo. Meanwhile, Luke and Aphra continue to be fascinating partners. Despite Aphra’s much darker nature, they have a lot in common, including the fact that they both used to be normal people. Their discussion about the Galactic Empire shows both sides of the galactic conflict through the eyes of two people just caught up in the fighting. The end of the issue is really intense, with several rebels seemingly captured, and the others in a very dangerous situation involving a mutated wookie and a heavily armoured guard. The art by Andrea Broccardo is mostly great. Although it’s a bit less detailed than the previous two issues, there’s still plenty of environmental detail and the style is close enough. Facial expressions do a great job at showing character emotions, whether it’s Sana’s cold stare when she first meets up with Aphra, Aphra’s look of shock when Luke mentions how the empire slaughtered his family, or Han’s blank stare when the queen seems to control his mind. That said, sometimes Luke’s face looks a bit off, and the eyes often look kind of flat and bland. Antonio Fabela’s colouring is well varied throughout the comic. The plants on the roof show a variety of flowers, mushrooms and grass. The lab is mostly gray with tubes of green liquids, and the red and black constantly surrounding the Citadel Queen only makes her feel creepier. This is a great comic and a great crossover. In case you didn’t know, Doctor Aphra originated from Gillen’s Darth Vader series, and she’s a great character in her own right. She’s kind of like an amoral Indiana Jones in the Star Wars Universe, equally capable of being a hero and a villain as dark as Darth Vader himself. Forcing Luke to team up with her is a great idea in itself, and making that team up a horror inspired crossover just feels right. Star Wars fans should be reading the main Star Wars series, and it’s well worth checking out Doctor Aphra’s series as well. Since this crossover features them both, consider this a great place to start. 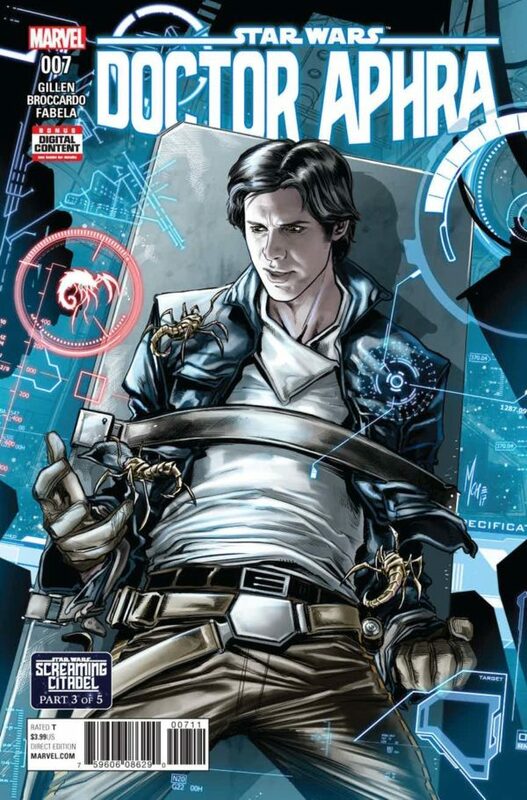 This entry was posted in comic, comic review and tagged andrea broccardo, antonio fabela, black krrsantan, comic review, comics, crossover, doctor aphra, han solo, horror, jason aaron, kieron gillen, luke skywalker, marvel comics, sana solo, star wars, star wars comics, the screaming citadel, wookies. Bookmark the permalink.